This two-piece tapis displays a pattern known as Raja Medal or King’s Badge. Rows of figures standing on the backs of 'naga' serpents alternate with bands of triangles. 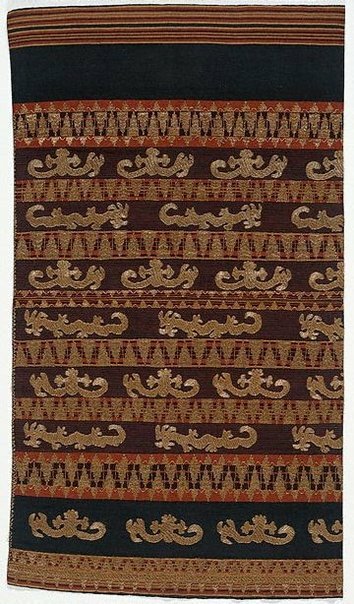 The designs are made of gold-wrapped threads couched ('cucuk') onto the warp-faced plain weave cloth composed of blue, red, brown, burnt orange, pale green, and ochre threads. 'Nagas' are associated with water, prosperity, and protection, and thus are good “ships.” They represent the trade that once made Lampung a wealthy community, while at the same time protecting the sailors and merchants involved in Lampung’s peppercorn and spice trade. 'Naga' ships were also used in ritual processions and ceremonies, when women would have worn skirts such as this one to indicate their rank in society. The repetitive triangle motif is an abstract form of bamboo shoots called 'pucuk rebung'.